Dr. Mustafa ef. Ceric: Soul has the right to freedom and moral conscience. Moral values of the soul freed of the slavery of a proud body are inclusive as the common wealth of all people. Individual lusts or passions of the body which challenge the moral values of the soul are individual, and in that private and therefore are not acceptable as the general condition of the spirit. The pages of human history worthy of our attention have not been written by those enamored with the lusts of the human body, but by those who had a moral soul and a free spirit. Reisu-l-ulema, Dr. Mustafa ef. 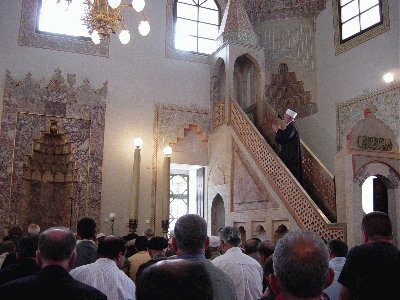 Ceric, led the mid-day sermon prayer and delivered second sermon of this Ramadan, in the Beg’s Mosque in Sarajevo today. The thought of the beginning and the end of our life shows the path to the Creator in the beginning, and the Judge in the end. However, some people do not want to understand and accept that this life has its Judge: - They say:”There is no life except for the one upon this world and we will not be resurrected!” (Qur’an, 6:29)...- And they say:” There is just this world, accessible to us, in which we live and die, we are only killed by (the passage of) time”... (Qur’an, 45:24). Therefore, there are people who believe in the Creator since they have no choice but to admit that this world did not happen by way of coincidence, but they do not believe in the Judge as they want to escape the responsibility for their own deeds. They, however, forget that it is not possible to separate the belief in the Creator from the belief in the Judge because it is not possible to separate the causes of our beginning and our end. We do not determine our beginning and our end, but our comprehension of the beginning and the end determines our morality, our behaviour. Since he who believes in the God Creator and God Judge has love for the giver of life and shame before the one who sees and knows everything. Therefore, in the Holy Qur’an, the belief in the Creator is inseparable from the belief in the Judge: - “Those who believe in God the Creator and in God the Judge, and who do good deeds, have no reason to fear (Qur’an, 5:69). - “If you believe in God the Creator and in God the Judge, even better for you”... (Qur’an, 4:59). As in it is the sense of belief - to initiate, in man, and sustain the feeling of responsibility for all he thinks and says, for all he does and makes. In it is the sense of this a.s. hadis: Do your self-analysis before you are being analyzed! Alleihisselam here reminds us of the fact that man is a creature which has the capability of introspection in that he can view his own soul. Therefore, there is a super-ego in man which is in close connection with the memory of the original identity (kalu bela). That seal (kalu bela) has been affirmed, by the Creator, upon a man’s soul and man carries it with him whether he is aware of it or not. But, through belief, man becomes aware of his seal, becomes aware of himself. Since it is not the body, but the soul, that which defines man. It is not that soul exists so that it listens to body, it is that body exists so that it listens to soul. Therefore it is necessary for the soul to take rest from the body, which body has its own lusts, which lusts are short-lived, sweet, yet sometimes leave bitter consequences for the essence of man. Those, who call upon the rights of their bodies in order to justify their unusual behaviours, forget that the soul also has its rights and in it is the right not to be a slave to an insatiable body. Soul has the right to freedom and moral conscience. Moral values of the soul freed of the slavery of a proud body are inclusive as the common wealth of all people. Individual lusts or passions of the body which challenge the moral values of the soul are individual, and in that private and therefore are not acceptable as the general condition of the spirit. The pages of human history worthy of our attention have not been written by those enamoured with the lusts of the human body, but by those who had a moral soul and a free spirit. Although we may say that all the ibadets in Islam are proscribed in order to strengthen, in man, the belief in God the Creator and God the Judge in order to enable him to have introspection in his own soul, it still has to be said of the fast in the Mubarak month of Ramadan that it is the highest most ibadet. In an honest and committed fast, the soul frees itself from the constraints of the body, and thus becomes able to remember its roots, to feel the closeness of the encounter with its Judge, to look into itself and see what condition it is in. Only through introspection of our own soul are we able to become better people; only through confessions of our own sin are we to hope for the Allah’s forgiveness; only through our caring about morality we may say that we belong to Islam. The soul has suffered for too long from the violence of bodily lusts and greeds. It is time for the soul to free itself from that violence. Man must understand that he will answer before God for his deeds upon the Earth. Although it may sometimes appear as if man can evade the Judge, by way of calling his belief in the Creator, man will, sooner or later, comprehend that there is no excuse upon the day when everything will be seen, and what crumble of his good was and what crumble of his evil was. Especially those, who take it upon themselves to have duty of care about man’s right to life, religion, freedom, possessions and honour, ought to be aware of that. Especially those, who have the authority and power to make our country a place of happy existence, ought to be aware of that. He, who has no true feeling of responsibility before God and people, is of no proper faith. Ramadan is the time that we as Muslims understand, and through introspection establish what is to be done so that we become even more aware that this life is a gift of God’s, which we must safe keep and duly return to the One who gave it to us. Allah Almighty, give us strength in our belief in You, the Creator, and You, the Judge! Allah the All-knowing, teach us in introspection so that we know which is the way to go! Allah the Merciful, we rely upon Your forgiveness and mercy! Amin!